I have been smitten with Drew Barrymore ever since I first saw her as the little cutie-patootie blonde girl in E.T. 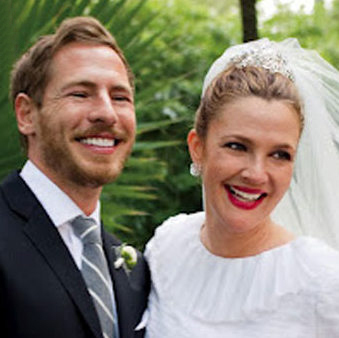 and since I have found her to be quite an endearing character, her comings and goings have always been of interest to me so I was tres curious to see the images of her tying the knot with art consultant Will Kopelman last summer. The radiant (and expectant) bride was decked out in a custom made muslin and organza Chanel gown, which featured a skirt embroidered with tulle flowers and a black belt which she accessorized with a pair of 'Fils de Camelia' diamond earrings and a 14 carat white and black diamond vintage 'Eventail' cuff, both by Chanel Fine Jewellery. Her gorgeous bouquet, designed by The Velvet Garden, was a mixture of cherry blossoms, pink spray roses, pink peonies and pink garden roses. 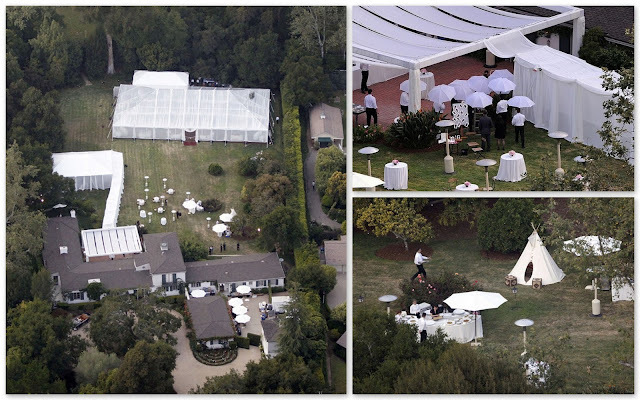 The wedding was held at Drew Barrymore's sprawling home in Montecito, California. I had heard that it was dubbed a 'backyard wedding' and while I am positive her backyard doesn't look anything like mine, I figured the relaxed theme appropriately rolled with her easy-going, flower-child persona. Touches of vintage inspired romance were everywhere as per the bride's request to wedding planner Yifat Oren. Gourmet appetizers such as lobster rolls, steak tartare with quail egg, foie gras on pink peppercorn shortbread and wines from the bride's own label, Barrymore Wines were on offer to the guests before sitting down to a formal dinner catered by LA restaurant Lucques and Top Chef Masters Naomi Pomeroy. Guests attending the celebration included Drew's Tinsteltown friends Busy Phillips, Reese Witherspoon and husband Jim Toth, Jimmy Fallon and wife Nancy Juvonen, and Cameron Diaz who read the E.E. Cummings poem “I Carry Your Heart With Me” during the ceremony. Does it get any cuter than a teepee set up for all the little kiddie guests to be entertained in for the evening? Games and movies for the children to watch were set up in the teepee while their parents enjoyed some fun of their own, courtesy of a silhouette artist and a black and white photo booth set up at the reception. 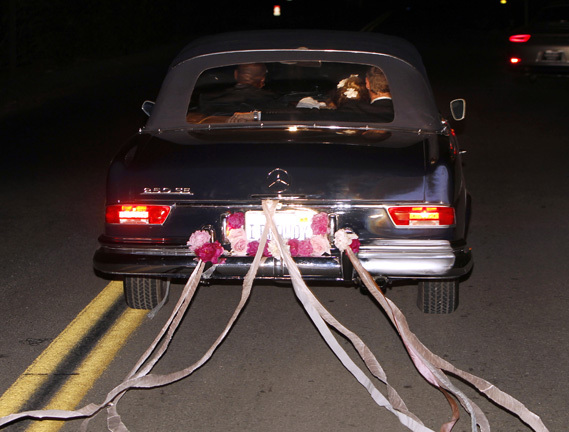 The happy couple left their reception in a vintage Mercedes convertible (a perfect choice if I may say so myself!) 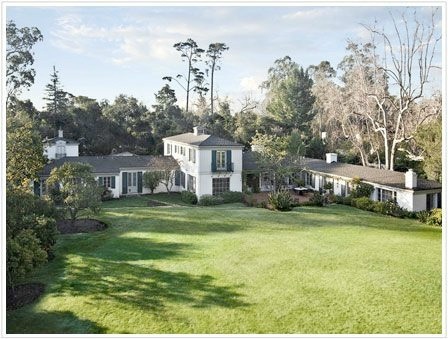 and spent their first night as husband and wife at the San Ysidro Ranch before they left for their honeymoon at the Post Ranch Inn in Big Sur, California. So, so lovely–and it makes me desperate to make a trip to Big Sur! I hadn't seen any photographs of Drew & Will's wedding. Gorgeous. They look so happy. her dress is perfect for her!